The application program available on the website is only valid for ETS4 or ETS5, is there a compatible version with ETS3? No, the application program developed for the InZennio Z41 is only compatible with ETS4 or ETS5. I cannot import the application program for the InZennio Z41, the ETS4 shows the message “The version of the Scheme is not valid", what can I do? 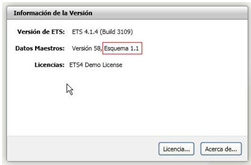 To import the application program for the Z41 is necessary to have the ETS4 software updated with a version of "Scheme" 1.1 or higher. You can view this information from the main screen of the ETS4, in the Overview section. The version information is displayed in the upper right corner. May I install the InZennio Z41 horizontally? May I use the KNX bus voltage (29VDC) as the additional power supply of the InZennio Z41? No, the KNX bus voltage is not a clean signal as it is modulated by the data. This signal can cause a malfunction of the screen. The KNX bus connector and the external power supply connector are opto-isolated to avoid potential interference with the KNX bus. Do I need an additional KNX power supply as external power supply for the InZennio Z41? No, the auxiliary power supply does not need to be a KNX power supply, a conventional power supply (12-29V DC), or the auxiliary output of some KNX power supplies is enough. What is the total consumption of the InZennio Z41? External power supply: the maximum consumption is 150 mA at startup with voltage of 12 V, but in standby, its consumption is reduced to about half of this figure. What is the firmware of the Z41?, and how can I update it? We call firmware to the base software preloaded on the device that handles the display of all items on the screen. The firmware is independent of the ETS application program, but both must be the same version for the Z41 to work properly. Via USB: using the adapter cable for USB firmware update connected to the mini-USB port placed on the back of the touch screen. The “.PAK” file for firmware update must be copied to the root folder of a USB flash drive. Should I update first the firmware or the software? Even though it can be done in both ways, from Zennio we recommend to update firstly the firmware version, and secondly the application program. The screen stays with blue background and it displays an “Error Software” message. What is going on? The “Error Software” message means a wrong correspondence between Software and Firmware versions. Software version X.Y must match with the firmware version X.Y.Z. The versions will be compatible when X.Y values are equal. What is the Ethernet input for? The Ethernet port built into the InZennio Z41 may be used to upgrade its firmware, and, starting from the version InZennio Z41 3.0 of the application program, for the remote controlling of the InZennio Z41 via IP from devices such as smartphones, tablets, personal computers, etc..
How can I know the Z41 MAC number? The MAC is displayed on the screen when the touch panel is in the firmware update state. It is also possible to know it by running the command “arp-a” in the command shell (cmd) of a computer connected to the same network. If a power failure occurs, do I need to re-set the date and time? No, thanks to the button battery included in the Z41, the touch panel allows to keep the date and time data after a power failure. When are the date and time of the Z41 sent to the BUS? The Z41 Touch Panel only sends the date and time data to the BUS when these two options are set, more specifically when the SET button is pressed, at the end of the manual parameterization. This feature allows synchronizing the date and time of the rest of Panels in the installation by creating two group addresses “Date” and “Time” to later link them with the appropriate communication objects in the rest of panels to synchronize; this way when adjusting date and time in one of the "master" panels, the rest of them will be also updated. When having several touch screens Z41 Pro, InZennio Z41 and Z41 Lite in the same installation, How is recommended to configure the time/date sending period? It is recommended to configure just one screen in the installation to send time and date periodically to the bus, disabling in the remaining devices the parameter “Time/Date Sending Period” that can be found at MAIN CONFIGURATION/ General. What alphabets can be displayed on the Z41? Is it possible to disable the temperature, date and time displayed at the top of the screen? Starting from the InZennio Z41 version 2.0, Z41 Pro 1.1 and Z41 Lite 1.1, it is possible to disable the display of this information through the GENERAL setting parameters independently. Can I show a temperature value different from the one measured by the internal sensor in the header of the screen? This is possible starting from the InZennio Z41 version 2.0, Z41 Pro 1.1 and Z41 Lite 1.1, by enabling this option in the GENERAL setting parameters. How can I display the values ​​received in an indicator control over time? Starting from the version InZennio Z41 v2.0, Z41 Pro 1.1 y Z41 Lite 1.1, it is possible to save a log of the values ​​received in indicator controls of 1 or 2 bytes simply by enabling this option via the "Save Log?" parameter. Then, pressing on the indicator will open a pop-up window that will display graphically the values received in this indicator over time. I have configured an “Energy Monitor” control to display the energy consumption and the objects that I need to link with my energy monitor do not appear. I can only see the objects “Energy Monitor: request” and “Energy Monitor: reset”, why? To use this “Energy Monitor” control, it is necessary to enable the monitoring channels via the “Energy Monitor Objects” tab that you will find in the MAIN CONFIGURATION section. For each channel, four objects will be created: “Power”, “Energy”, “CO2” and “Cost Estimation”. I have configured a 2-button control and the value sent by each button does not correspond to its icon. What’s happening? When configuring the 2-button control, it must be taken into account that the icon selection parameter does not assign functionality to the button. The icon is independent of the value sent. Starting from version InZennio Z41 v2.0, Z41 Pro 1.1 y Z41 Lite 1.1, all the 2-button controls will have a parameter called "Action" that will allow exchanging the value sent to the bus between the left and right buttons. I have configured a RGBW control and the object corresponding to the white channel does not appear, I can only see the objects corresponding to the red, green and blue channels, why? To use the white channel, it is necessary to enable it via the “White Channel Objects” tab that you will find in the MAIN CONFIGURATION section. For each channel, one object will be created: “[RGBW] White Channel”. This is due to the particular structure of the "Scenes Control" DPT. For further information consult the Scenes Control documentation at our website, available in the Support - Documentation area. Every device involved in the Scene has a specific Communication object "Scenes". It will only be necessary to link this with the "Scenes" Communication Objects in the devices involved in the predefined atmosphere. For further information consult the Scenes Control documentation at our website, available in the Support - Documentation area. I want to show the current scene in the InZennio? How can I learn scenes with the InZennio? Z41 Pro includes two inputs that can be configured as binary inputs of types push button or switch/sensor. Z41 Lite includes two inputs that can be configured as binary inputs of types push button or switch/sensor. ZAS o Roll-ZAS includes two inputs that can be configured as binary inputs of types switch/sensor. Z38 y Z38i includes four inputs that can be configured as binary inputs of types push button or switch/sensor. Square TMD-Display includes two inputs that can be configured as binary inputs of types push button or switch/sensor. Square TMD includes two inputs that can be configured as binary inputs of types push button or switch/sensor. TMD-Display includes two inputs that can be configured as binary inputs of types push button or switch/sensor. Touch-My Design Plus includes two inputs that can be configured as binary inputs of types push button or switch/sensor. MAXinBOX 66 includes six inputs that can be configured as binary inputs of types push button or switch/sensor. MINiBOX 45 includes four inputs that can be configured as binary inputs of types push button or switch/sensor. MINiBOX 25 includes two inputs that can be configured as binary inputs of types push button or switch/sensor. ACTinBOX CLASSIC y ACTinBOX CLASSIC-HYBRID includes six inputs that can be configured as binary inputs of types push button or switch/sensor. DIMinBOX 2CH includes two inputs that can be configured as binary inputs of types push button or switch/sensor. MAXinBOX Hospitality includes six inputs that can be configured as binary inputs of types push button or switch/sensor. MAXinBOX FC 0-10V FAN includes four inputs that can be configured as binary inputs of types push button or switch/sensor. MAXinBOX FC 0-10V VALVE includes four inputs that can be configured as binary inputs of types push button or switch/sensor. QUAD includes four inputs that can be configured as binary inputs of types push button or switch/sensor. This is an issue related with the status update of the input. It will be necessary to update the inputs with the status of the corresponding output that is activated by the input. The object of the input should be linked, not only to the group address that activates the output, but also to the group address where the status of that output is sent. I have several scenes scheduled to be launched at the same time and only one is launched, why? Due to the fact that the scene object is unique to the entire touch panel, it is only possible to launch one scene at a time, more precisely, the scene launched will be the one set in the last box of the last page. To avoid this effect, the sending of the scenes can be shifted in time. How can I schedule a Heating System timer using special modes? 1. Enable Automatic ON when a new special mode arrives in Thermostat configuration and enable Trigger in parameter 1-bit objects working mode in Setpoint configuration. 2. 3 new Communication objects appear for each special mode activation. When sending "1" to any of these objects, the specific Setpoint Temperature is set while an ON order is also sent to the Heating system. 3. Enable four Schedule Programming controls: three controls to send "1" to the corresponding special mode and one more to send the scheduled OFF. Comfort: with the Comfort object of the thermostat and the timer object of the corresponding control. Standby: with the Standby object of the thermostat and the timer object of the corresponding control. Economic: with the Economic object of the thermostat and the timer object of the corresponding control. OFF: with the ON/OFF object of the climate system and the timer object of the corresponding control. If you do not know if your Zennio device allows the motion detector connection, just look into the device website and you will find that information in the product datasheet. What is the Technical Alarm Cyclical Monitoring used for? 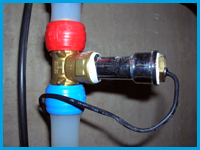 This function allows a critical alarm system monitoring ( ie gas sensor) to check its proper working in the installation. The function in this case, waits for a value reception to confirm that the system is working properly. If this value is not received within the specific time parameterized in the ETS, the alarm goes off warning users of a possible problem in the device. Climate "MODE" Communication object structure in Z41 Touch Panel. This DPT structure is actually implemented in all the Zennio devices, including the IRSC-Plus. This way, all the devices can be integrated together in an installation, as their Communication Objects structure is identical. For further info, please contact our Technical Department. What is the Special Mode control of the Z41 for? 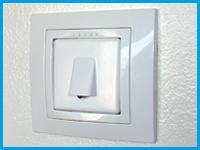 The Special Mode control is used to set pre-configured setpoints in the thermostat. For further information about this functionality, see the manual of the “Building” thermostat. Can I restrict the setpoint temperatures in public buildings with the Z41? Yes, the Z41 temperature controls allow restricting the range of allowed values. The internal temperature sensor of the Z41 shows a higher temperature value than the real one, Why? The InZennio Z41 usually gets hot during its programming in such a way that the real temperature is distorted during this time period. The InZennio Z41 will recover the real temperature once it returns to its standby status. Furthermore, supplying the InZennio Z41 with a voltage value or another can cause variations in the measurement of the temperature; however, the temperature displayed is automatically calibrated by selecting the “Power Supply Voltage” parameter properly. Additionally, the internal temperature sensor can be calibrated manually from the ETS setup or from the configuration page. Can the temperature measured by the internal sensor of the InZennio Z41 be sent periodically to the bus? Yes, within the parameters of the InZennio Z41, it is possible to choose a cyclic sending period of the temperature measured by the internal sensor with a range between 10 and 1000 s.
What is the welcome object for? The welcome object can be used to send a binary value to the bus or to launch a scene, the first time that the touch panel is pressed after a configurable time of inactivity. This object can be very useful to turn a light on or to launch a welcome scene. What is the locking for? The lock object allows enabling or disabling the touch area of the Z41, so that if the screen is locked, it ignores any press on it until it is unlocked. This object may be useful to disable touch panels installed in public areas. Can the Z41 be controlled by using an infrared remote controller? Can I control my Z41 from my smartphone or tablet? Yes, starting from the application program version InZennio Z41 v3.0 and Z41 Pro v1.1, it is possible to control your Z41 from your smartphone or tabled with Android or iOS. Is it possible to receive Z41 notifications in my smartphone or tablet? For a proper notifications reception, your smartphone or tablet must be paired with the touch panel Z41 and the Z41 Remote App must be updated to the latest version. Is it possible to use Z41 Pro or InZennio Z41 as a KNX-IP interface for programming or monitoring? No, it is necessary to use a KNX-IP Interface or KNX-IP Router. The Z41 IP connection is to control it remotely from any iOS or Android device and to update the firmware. How can I control Z41 Pro or InZennio Z41 remotely using my Smartphone or Tablet? To enter the pairing code provided by Z41 in the corresponding box in Z41 Remote. Take into account that the touch panel must be connected to the network by using a wired connection which has not a previous wireless section. Can I control my Z41 from a Smartphone or Tablet connected to the same local network but without access to Internet?